BBC Radio 4's Law in Action will be broadcast on Friday, 27 February, 2004 at 1600 GMT. 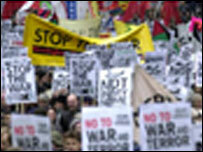 A recent court ruling has been hailed as a "landmark victory" for a party of anti-Iraq war protesters. Two senior judges held that activists were unlawfully detained by the police when their coaches were stopped on the way to a protest at RAF Fairford in Gloucestershire. The 120 protesters may each be able to claim £3,000 in compensation. In their judgement, Lord Justice May and Mr Justice Harrison said the police had been entitled to stop the protesters because of fears of a breach of the peace. "there was no immediately apprehended breach of the peace to justify even transitory detention".